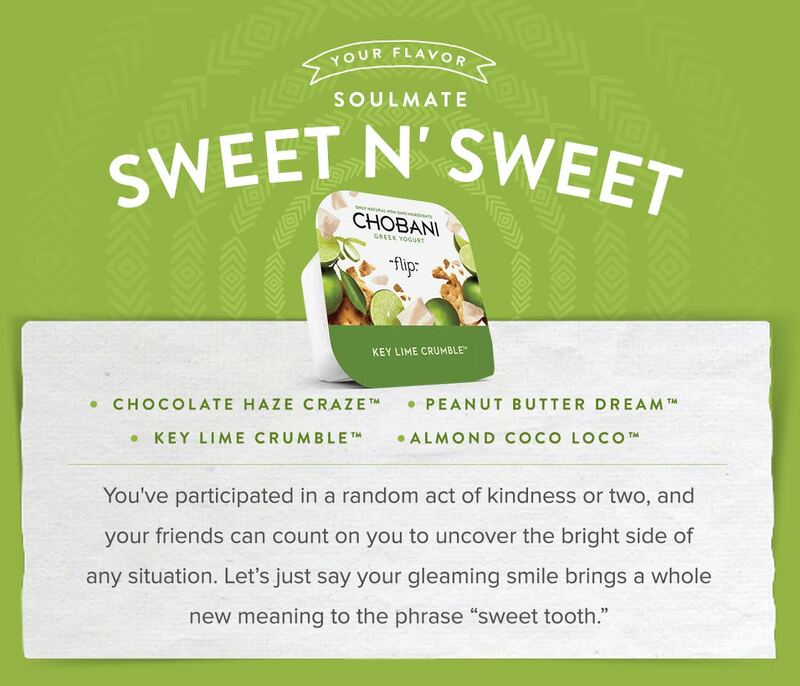 Disclosure: I was invited to do this blog post by Chobani. All opinions are my own. Hi everyone! Most evenings I crave something sweet, especially after I eat dinner. My go-to sweet snack is usually yogurt. One of my favorite brands of greek yogurt is Chobani, and recently they came out with this new type of yogurt called Flips. This new design of yogurt brings the two tastes of fruit and yogurt together in a totally new way. The container is split in two and on one side there is vanilla greek yogurt and on the other side there is fruit, nuts, etc. I always like to try different and unique foods. A personal favorite combination is mayonnaise on onion rings. Another combination that is very delicious is vanilla ice cream with peanut butter. Do you have any unique food flavors you like mixing together? 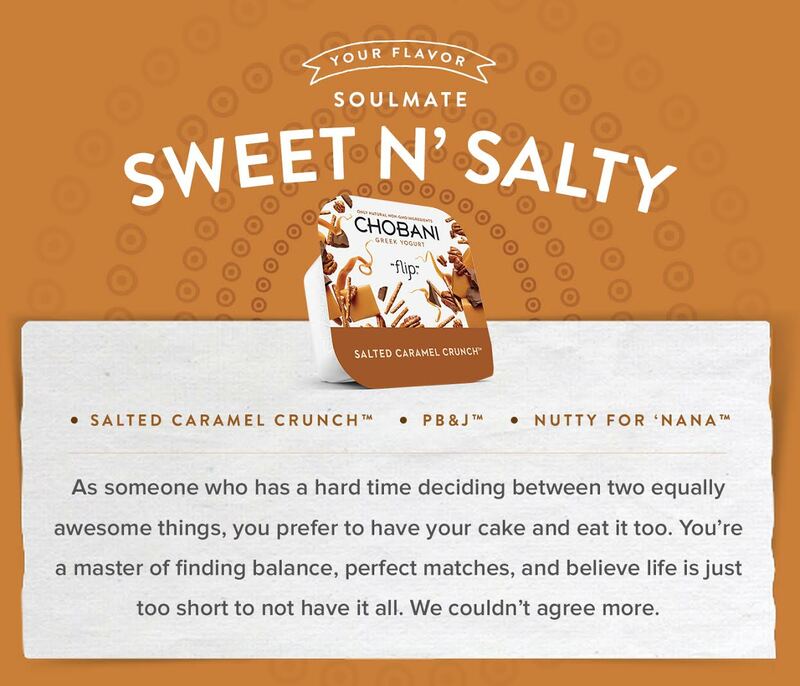 Chobani sent me a few pictures of their Flavor Soulmate flow chart to help you find what Flip you might like to try. 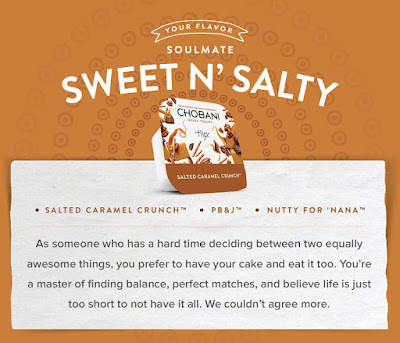 I wasn't a huge fan of the Sweet N' Salty just because it's not the usual flavor I crave. It definitely has the ability to satisfy the craving for something sweet and salty, but at the time I ate it I was very full and could not appreciate it. The flavors are very unique and I think that you all should at least try it before you knock it. Who knows, maybe your next favorite yogurt will be sriracha mango or key lime crumble? Which yogurt sounds most interesting to you? And which yogurt would you most likely try? I love Chobani yogurt, and like you, when I need something sweet will have a Flip! 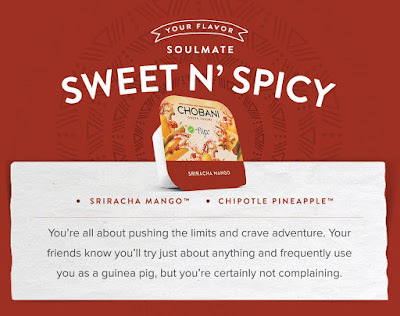 I've tried most of the flavors except Sriracha Mango since I don't like mango. My favorite is the Almond Coco Loco! And to top them off, I sometimes add extra pineapples or strawberries for a very yummy treat! I love Chobani with fruit and granola...yum. I've heard about these! Was wondering how they taste. I love fruit flavors. Yum, yum, yum! I've never tried these before, but will have to soon :) Hugs to you! These sound great, but I'm more likely to reach for a hunk of chocolate after dinner lol. I have yogurt everyday and these sound so yummy. I will have to look for them in the grocery store. These would make for a great snack in the evening. Thanks for sharing Julie. Have a great rest of the week. These do sound like some fun flavor combos! I'll have to keep my eye out for them! The salted caramel crunch and key lime crumble both sound delicious to me!